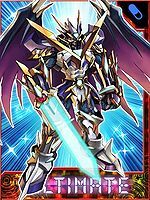 A Holy Knight Digimon based on a legend that only appears within a certain "Prophecy", handed down from the ancient Digital World. 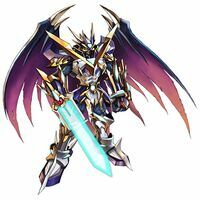 In that "Prophecy" is written the appearance of the "Royal Knights", the guardian deities of the Network, and based on the "Prophecy", it is said that the Digimon that are called the "Royal Knights" will assemble at the time of the Digital World's greatest crisis. 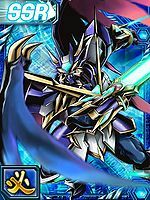 Ulforce V-dramon possesses the swiftest speed among the "Royal Knights", and there is no one that can follow its movements. 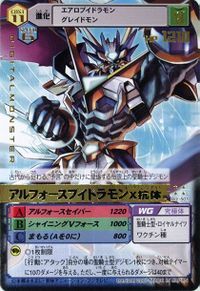 Also, its body is wrapped in holy armor made of the lightest-weight rare metal "Blue Digizoid", which is rare even among Chrome Digizoid, so it can cleave the sky and split the earth. It can extend its Ulforce Saber and its Tense-great Shield from the "V Bracelets" equipped to both of its arms. 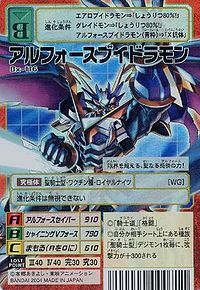 Its Special Move is a beam which strafes across from the "V"-shaped armor on its chest (Shining V-Force). The "Ulforce", its own ultimate force, has been drawn out further, even more so than its swift speed. The "Ulforce" also has remarkable healing abilities, so it instantly self-recovers from any damage. 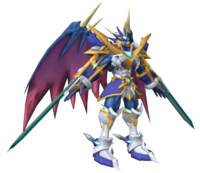 Even if you catch sight of Ulforce V-dramon briefly and attack it, you will immediately suffer a counterattack with all of its power. A portmanteau for Ultimate Force (「アルティメットフォース」 Arutimetto Fōsu). Short for Dragon (「ドラゴン」 Doragon). Fires a ray of energy from the massive V on its chest. Generates a beam-sword weapon from its right wrist. Ulforce V-dramon X-Antibody appears in the Lament of the X-Antibody chapter (慟哭のＸ抗体編 Dōkoku no X-Kōtai-hen). 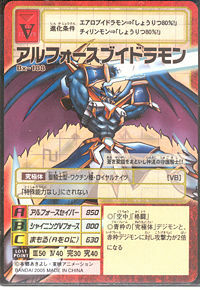 It is also an obtainable Digimon which is evolved from Ulforce V-dramon. It can also be obtained as a collectible card. 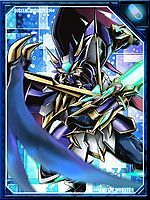 Its card can be unlocked when completing the V-dramon Evolution (ブイドラモン進化 Buidoramon Shinka) set. Ulforce V-dramon X-Antibody is available as a Digimon Medal. Evolves from Hisyaryumon, Mametyramon, Megalo Growmon X-Antibody, Skull Baluchimon, or Triceramon X-Antibody. Can also be obtained by Jogressing Mametyramon and Skull Baluchimon. 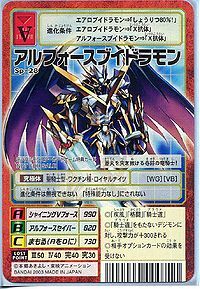 Can Jogress with Alphamon (1.0) or Death-X-DORUgoramon (1.5) to evolve into Dukemon X-Antibody. Can evolve from any Child through Ultimate Digimon, once the X-Point Gauge reaches 20. It surpasses its limits with the holy Ulforce, the power of emotions! A swift guardian knight clad in blue holy armor!! A miraculous dragon knight that pierces through the azure sky! 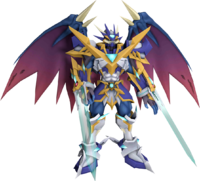 A legendary Holy Knight Digimon who only appears within a "Prophecy" told of since ancient times. This page was last modified on 29 December 2018, at 06:22.